In this recent era of cutthroat technology, everyday varieties of innovative and more effective business or marketing strategies are opening their eyes. However, the revolutionary web technology transformed Email as a highly effective source of marketing to promote your own product and services. Almost every business owner ranges from higher to lower level does not hold back to employ email campaign and email newsletter, which is highly potential to boost up their business. Prior to getting indulge in the nitty-gritty of Email newsletter template let me define what Email newsletter is all about. Basically, it includes a specific topic based on subscriber’s interest. Also, it puts a valuable contribution to announce the latest information and news about the company, upcoming events, promoting or advertising the brand or product/services etc. Therefore, almost every business owner feels proud to accept direct online marketing through an email campaign carrying healthy volume of web-traffic and conversion rate. In the next section of this post, I am presenting some tempting Email Newsletter template design backed with innovative functionalities that keeps your existing or potential customer updated with the latest ongoing and upcoming events. This eventually tends to promote your website as well as your business in an innovative manner. In the same context, if you crave to adopt the practice of email campaign with beautiful email newsletter template then it is not a matter of worry anymore. Here, I have congregated variety of stunning template design that can be easily attained by you or almost every business owner in lack of any hassles. 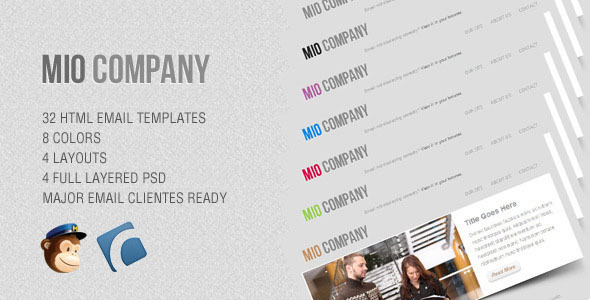 Though a myriad of free and premium templates are available on the web to procure. However, I have collected these email newsletter designs to select accordingly that fits precisely to your business ensuring your ease and comfort of use. 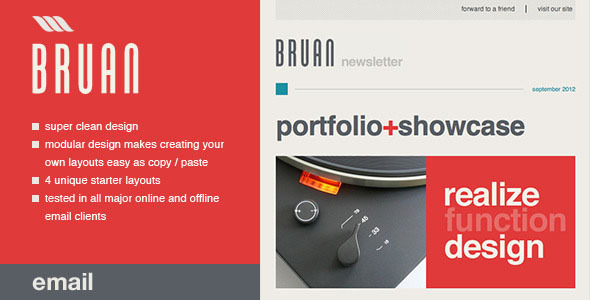 So let’s go ahead to explore these newsletter templates one by one. 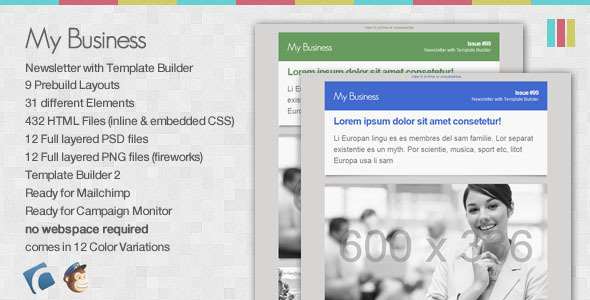 This is an elegant fully customizable template that has been designed to meet the complete HTML package. It is featured with a fully layered Photoshop file of template and buttons, 4 HTML email templates and complete documentation. These templates are compatible with most commonly used online and offline email clients along with BlackBerry, iPhone and iPad devices. 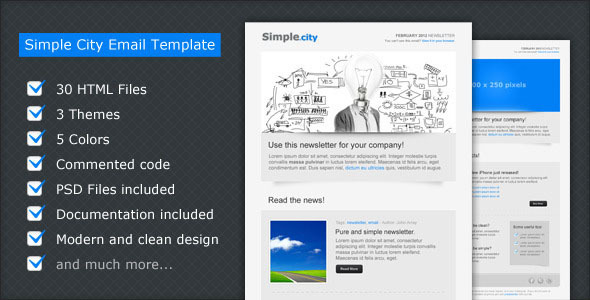 This exclusive email template comes in 5 color themes, two background versions in light-dark gray and 12 layouts. Apart from this it provides extra flexibility in documentation that includes sending the newsletter, Mailchimp integration and layout editing. Other features like well commented valid HTML and layered Photoshop file are appreciated along with functionalities of copy/paste/delete the content table. 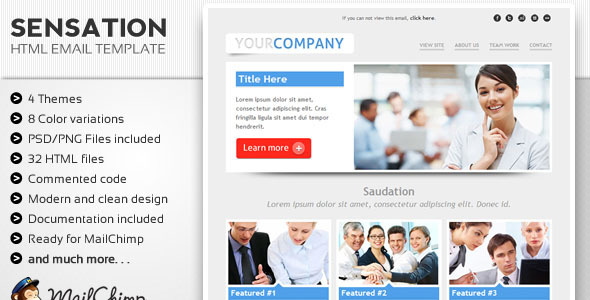 This is the perfect email template to impart information with very innovative appearance. Some of the appreciating features it comes included with are 4 layered PSD files, 32 Email Newsletter templates, Ready for MailChimp integration, Flawless customization, 8 color themes and well documented. My Business is the exclusive email newsletter template builder ensures excellence in designing newsletter and template with support of facets of this template. It is complimented with various astonishing privileges like 12 multi-layered PSD & PNG files, Template Builder 2 & ‘My Template Builder’ Access, Instant MailChimp and Campaign Monitor integration, 432 HTML files with inline & embedded CSS. It is available in 12 color variations and 9 pre-build layouts. 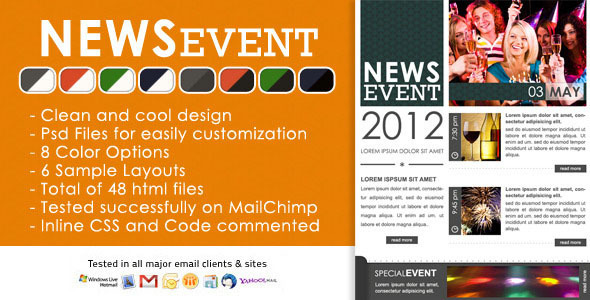 With this splendid email newsletter template you can create an amazing appearance for your email newsletter. It will be derived from distinct embedded features and advantages like 48 HTML newsletter pages complimented with 6 layouts and 8 color themes. It provides complete freedom to copy/paste or delete any sorts of content block or table. Also, it flaunts over well commented valid HTML and fully layered elements PSD files. This is one among the pioneering email newsletter ideal for several agencies and companies to use. When you will explore out its features being integrated then it include 32 customizable HTML files, Inline CSS, 670 pixels width, 8 color variations and 4 layout options and others. In additions it comes ready to be integrated with most commonly used email readers like MailChimp, Thunderbird, Yahoo mail, Gmail, Hotmail and others. 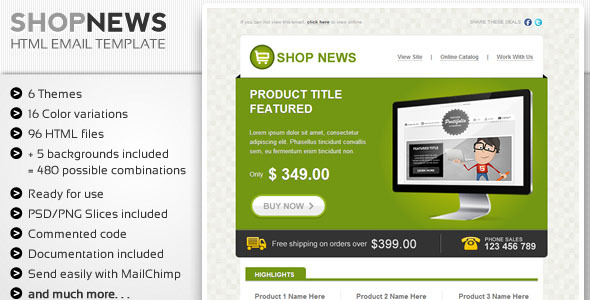 The Shop News email newsletter template especially designed for sale of goods, e-commerce and product dissemination. It is complimented with a wide array of exclusive facets including 16 color variations, 670 pixels width, integrated with CSS3 code, background designing, ready to use and customizable 96 HTML files, simple and easy customization, convenient to send with MailChimp and compatible with major email readers. This is an astonishing email template specially designed with detail and care to sell and promote your band and is obvious to use as a newsletter. 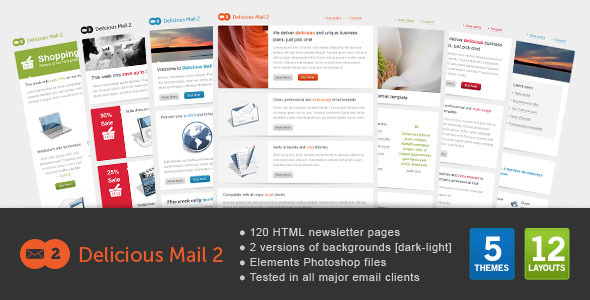 It is complimented with 30 email HTML files, neat and clean design, commented code, included PSD files and documentation along with 3 distinct themes for the Newsletter, Intro and Products. 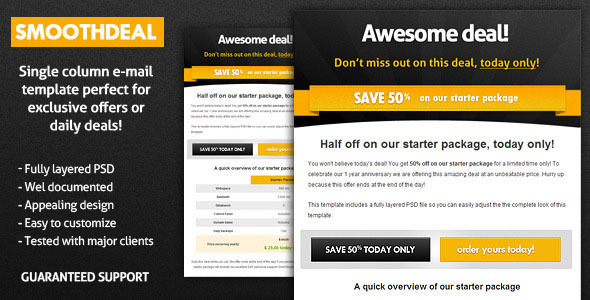 This is one among splendid email template specially designed for sending exclusive deal and offer even on a daily basis. It reveals an eye-striking look and feel with capability for easy customization. For fast customization it features a lightweight design and easy package. Hopefully this post Latest Premium Email Newsletter Template for Successful Marketing would be highly beneficial for entire groups of business owners and users at every level to design beautiful email newsletter and thus attain an effective email campaign and online marketing to advertise, promote and sell your product or services.